If you’re looking for the biggest and best waterfall in Bali, this is probably it! Sekumpul is a huge twin waterfall in Singaraja with two 260 foot tall falls pouring out of the jungle treetops. This waterfall is no longer a hidden gem, but since it’s in far northern part of the island and pretty far from town, the crowds are still not too bad. The hike to Sekumpul waterfall (aka Grombong waterfall) is pretty straightforward, but I’d rate it as moderate. It’s not dangerous, but the steep hike up and down is a big workout and it takes about 30-60 minutes to get there, depending on where you park. There are two viewpoints at Sekumpul — one above the waterfall and one below it. 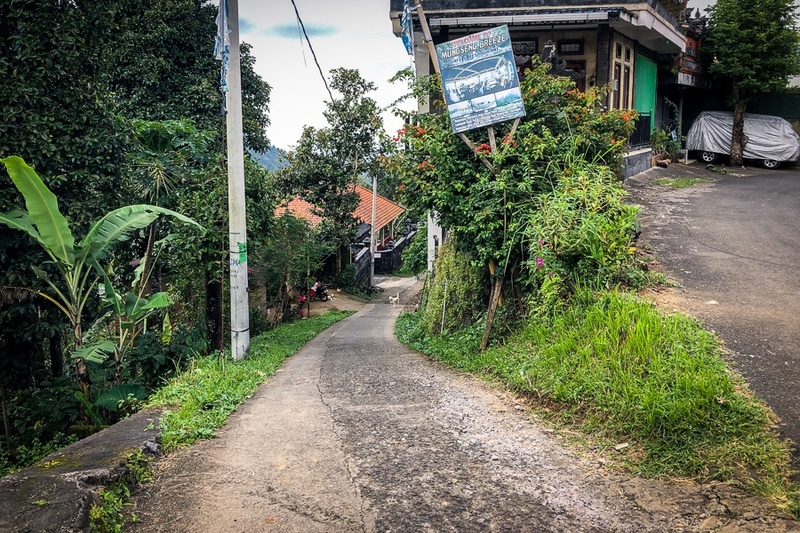 Don’t just stop at the first viewpoint, you should definitely check out both! You’ll want to wear bad shoes, because the hike gets VERY muddy near the end. The rocks at the bottom of the waterfall can be a bit slippery too, so watch out for that. There is an annoying scam at Sekumpul Waterfall where a group of locals has set up a series of fake (but convincing) “registration” checkpoints along the road on the way there. If you stop at one of these, they will try to force you to hire a guide for 450,000 IDR ($30 USD) per person. They will tell you it’s dangerous and required. Tell them you don’t need a guide, or better yet, just keep driving. This works better if you’re in a car, of course. If you drive through without stopping, it’s possible to bypass the scammers and the bogus registration completely. 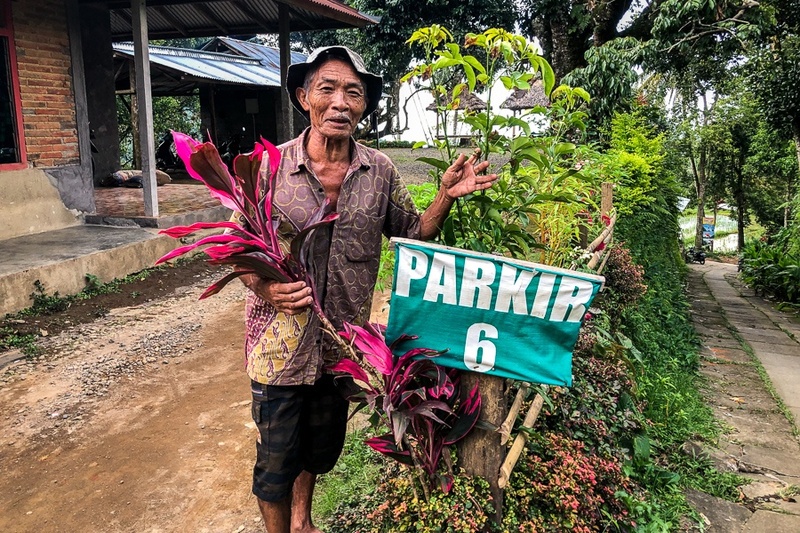 Next, you will need to stop in Lemukih village and hike from the south entrance there, NOT from the north entrance at Sekumpul village (which has a metal gate where they WILL stop you). The area is a bit confusing at first, but hopefully the pictures below will help. This guy is NOT one of the scammers. He is cool. He asked to be in this pic. On the left is the last (and best) car parking area for the hike. On the right is the foot path down to the falls. 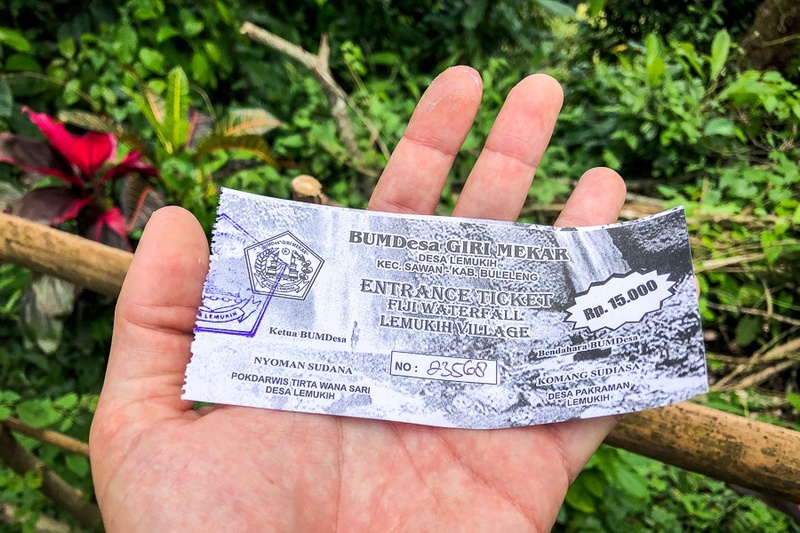 This is the REAL entry fee for Sekumpul waterfall (also includes Fiji waterfall). This ticket is sold by a one eyed gentleman at a booth halfway down the foot path. Keep in mind this is a very poor, remote area of Bali where the locals have very few legitimate ways to make any money. Do think about things a little bit from their perspective, and then make your own decision about whether or not to use the “mandatory” guide. I’m sure they are helpful for taking your photos and such, but the path is pretty safe and easy to follow without a guide. It’s definitely not necessary. If the price was reasonable, I might be inclined to pay it just to help out the locals. But being forced to pay $30 per person for a short hike is not reasonable in my book. Sekumpul Waterfall is in North Bali, about 2.5 hours drive from Ubud or 1 hour from Singaraja. Make sure you stop at the last parking area; it’s significantly closer to the waterfall so it’ll save you from hiking as far. The walk to the falls from the last parking area is only about 30-45 minutes.